One of the most popular products this summer has been the Sweet ‘N’ Smoky Chocolate BBQ Sauce. I’ve tried it a couple of times at different parties, and it was to die for delicious. It gave the small chicken chunks we were sampling it on an “all day on the smoker” flavor. It had great little hints of sweetness too. I knew that I had to make some kind of juicy meat in the crock pot that this sauce would be perfect on. The first thing that came to mind was country style ribs. They tend to be marbled with lots of fat that renders during the cooking process and this keeps them super moist. Man oh man am I glad I went with country style ribs….. the only complaint was that there wasn’t more! 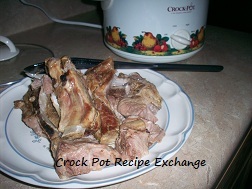 ﻿Place the ribs in a 2 1/2 – 3 quart crock pot. Cook on high for 4 – 5 hours or on low for 3 – 4 hours (I used one of my newer crock pots that the low and high settings are the same temperature, it just takes longer for that temp to be reached on low). Once the ribs are done remove them from the crock pot and place on a plate. 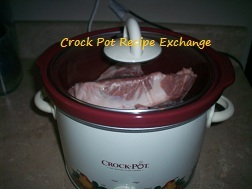 You are now going to drain any excess fat that was left in the bottom of the crock pot. I use an old spaghetti sauce jar, but any heatproof container would work. At this point you could return the ribs back to the crock pot and add the sauce. What I did was loosely shred the meat after seperating it from the bone. I was also able to get out any large chunks of the fat too. Now place the meat back into the crock pot and make sure the crock pot is on low. I only had to use a cup of the Sweet ‘N’ Smoky Chocolate BBQ Sauce to stir in to the shredded meat. Cook on low for 30 – 45﻿ minutes, just to heat it through. This turned out super good. The smokiness of the sauce was the perfect accompaniment to the pork. It tasted like it had been cooking on an outdoor smoker all day long. It also took very little of this sauce for it’s flavors to come through. 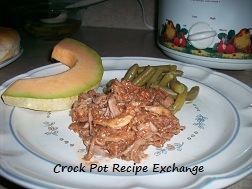 The next time I make this I’m going to double the recipe and use one of my 6 quart crock pots. 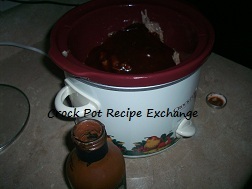 After I shred the meat I’m going to return it to a 2 1/2 or 3 quart crock pot before adding the wonderful smoky sauce. 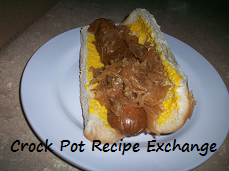 I also think this would be a perfect dish to serve buffet style at a potluck or backyard dinner. 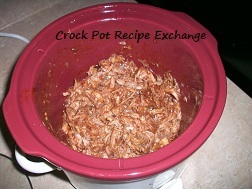 It should be okay to put your crock pot on the warm setting and keeping it covered for at least 3 hours. 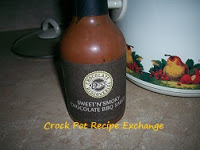 Oh yeah, I also wanted to mention that on Friday during my blogiversary crock pot party I’m going to be giving away a bottle of the Dove Chocolate Discoveries Sweet ‘N’ Smoky Chocolate BBQ Sauce to one lucky winner!